There is a park near here, at the end of the lake. It's a lovely park, very popular with children. I went there as a child. Took my children there when they were young. And now, I have students who go there. One of the most popular activities at the park is feeding the birds. There are Canadian geese all winter and a variety of ducks and smaller birds all summer. A pair of swans, last I knew. 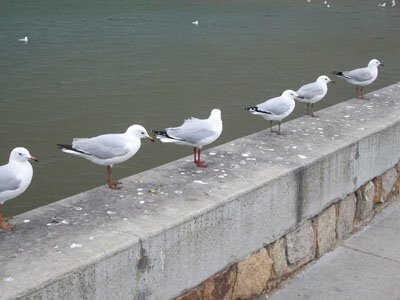 But by far, the most popular have to be the gulls. Everyone calls them "seagulls," but of course, they aren't. We're nowhere near an ocean. There are hundreds of them. Maybe thousands. They love being fed bread, or popcorn, or, if you aren't careful, your lunch. We saw one steal a meatball once. Poor bird got it stuck in its throat. You know the birds in "Nemo" who say "Mine! Mine! Mine!"? Yeah. No kidding. I was watching the birds one day when I noticed something. When they aren't swarming around some poor kid, trying to steal his sandwich, they are often sitting on the tops of the pavilions. And when they are still, they seem to prefer to keep a certain distance from the other birds, so they are all pretty much evenly spaced. Once I noticed that, I also saw that the birds liked to maintain a certain distance from each other, and from people, when they were on the ground. I played with one bird for quite a while. When I walked towards him, he would back away from me. Just enough to keep his distance. Huh. I even got him to walk to the side, and to walk towards me as I backed up. Always keeping his preferred distance. Interesting. I couldn't help but turn it into a game. I'm sure people thought I was nuts. I stood on guard. Advanced. He retreated. Retreated, and he advanced. Cool! We could fence! When I tell this story to my students, I always ask if they have seen the birds at the park, and they always have. I ask if they have ever tried to catch one- a favorite game at the park. Most of them raise their hands. Then I ask if any of them have ever CAUGHT one. Why not? Why hasn't anyone ever caught one of the birds? The first answer offered is always that the birds can fly, which is true. They can. But interestingly, that isn't usually why they don't get caught. They DON'T usually fly. They COULD, but they don't have to. So how do they get away? How do they keep their distance? The thing is, my legs, although not long by human standards, are MUCH longer than the tiny little bird legs. If I take a bird-sized step towards the bird, he takes a bird-sized step away from me. No problem. But what if I take a human sized step, or even a giant human sized step towards the bird? He can't take a human sized step away from me. His legs are too tiny. The kids all know. They've seen it hundreds of times. The bird takes several bird-sized steps, in rapid succession. If I try to go to the side, to flank the bird, he can easily change direction and keep away from me. If I stop, he can stop, without losing his balance. He doesn't even have to think about it. Which is good. His brain is not even as big as his legs are long. I use this story when I teach advances and retreats, to help the students understand why it works better to take several steps of a manageable size than to try to take huge steps. Even though I can take MUCH bigger steps than the bird, he can always easily outmaneuver me, taking smaller steps. His smaller steps are quicker and more balanced, with less time spent with one foot in mid-air. He can change directions, stop, start, stop and start again, as he needs to, always keeping me away from him. I can give you directions to the park, if you don't have your own local bird hangout. Try it. See if you can get a bird to play with you. It's enlightening. I love it when a good metaphor or analogy is found! It always helps me be a better teacher. Thanks for this one.